Great food, great service and a good app. The hardest part of ordering was choosing options. Quick service without even having to pick up the phone! I love the Apple pay built in, so I don’t even have to look for or save the card details in the app. There is room for improvement... There is no option to order a box of chips or cookies, instead of individuals. And how about Jimmy Johns swag? Shirt or hat, or free swag after five orders? Or even a point system And there is now way to exit the history pop-up window, except to kill the app. Long live Jimmy Johns! Great app, just click favorites and order, done. Fast good food. I love jimmy johns but I’ve given up on using this app. Every time I’ve try to use it I’ve had issues with the payment. Usually it will charge my card and I’ll sit around for 45 minutes waiting for delivery before calling the restaurant and finding out my order was never received. They always refund my money, but it’s getting very old. The app saves all my info & my favorite sandwiches for easy ordering. Never have had an issue. Ever if I were to have one, they would fix it as fast as they deliver. The first time I used the app, I placed my order and my food arrived 3 minutes later. Ridiculous. It’s so easy to save your favorites and the sandwiches are beyond compare. Fresh ingredients, simple and delicious!! Keep up the good work Jimmy John’s!! Great app for fulfilling delivery orders or just exploring the menu. If there is one suggestion I have, include the person’s address on the checkout page. It just shows contact information which is fine, but showing the full address one more time would be helpful. Thanks! I wasted my entire lunch period waiting for this delivery that is 1 mile away in Hazelwood, MO Lindbergh Blvd. by the time it came the ice in the soda was melting and watered down. I guess this means no more JJ on the weekends. This is one of the better food apps. It definitely makes ordering very easy (maybe a little too easy). I like being able to see previous orders, store multiple addresses, and find nutritional information for their entire menu. Being able to tip through the app is a bonus too. And the order tracking lets me know when I need to put on some pants to answer the door. Jim johns is my go to. They were there for me when no one else was. Perfect app makes it super easy to order and it arrives within minutes. I talk to the delivery drivers constantly when im lonely. Please come back Martha. Very disappointed the app stopped working and the last update did nothing to help it refuses to process payments and the Traverse City stores must not keep their employees happy because now you can't even call an order in. It's like they decided they no longer want my business at all. (I tip and am polite until asked to repeat my card number five yes 5 times.) Disregard below review they have changed for the worse: "So far this is the only place in TC that has a comprehensive menu & ordering app. It took a few tries to get my payment info loaded and saved, for a while having to re-enter every time made me not use it. But now it works perfectly right down to choosing pickup times. This is also the only place I can get a truly low carb meal prepared, their unwhiches are awesome they must get lettuce wrapping classes." I love the app and JJ itself. Wish there was a tracking feature. Either you sandwich has been made or is on its way or something, like other delivery apps. Otherwise, not complaints. I travel for work and use the ap all over the country. The location finder could be better, but otherwise it works great. Just spent 30 minutes trying to get an order to go through. Kept getting a credit card error. Used multiple cards but nothing doing. Ended up placing the order for cash. Luckily, there’s an ATM close by so I could get the money needed to pay for the order. Used this app several times, but started to notice that I can’t edit the tip. Especially when it’s being delivered I like to give a really good tip. Need an add cheese option. Both the app and online don’t let you correctly enter credit card information. This app seems really cool except my local JJ has sprouts but I am not able to add them to my sandwich on the app. Hope they fix it soon. First of all they never gets my order wrong. Like dominos. They are passionate and careing. I can’t even get to place my order app gets stuck on loading after selecting my sandwich. And yes I have restarted the app and phone as well. Used it multiple times now. Never had any problems. Ignore the lower ratings. The app is perfect. I don’t want to use Apple Pay but have no choice. There needs to be a choice! Great app. Easy to order and reorder your favorites. Easy to pay and fast delivery. Thanks! Glitch in app that causes “NO TOMATOES” to become “EZ TOMATOES” upon saving the customizations. I am using the app on an iPhone 7, so maybe the app is tailored for a Plus (+) screen width? I don’t want *any* tomatoes on my freaky fast sub... is that too much to ask? Yesterday, I tried to use this app to order sandwiches to be delivered to my apartment. However, when I entered my “Deliver To“ address and pressed the “Confirm Address” button, a message box popped up saying, “Sorry! We didn’t find that address. Please try again.” I repeated this process several times, confirming every time that I had correctly entered my address. I don’t live anywhere strange or off the grid. I do plenty of online shopping and many online sites/apps/companies have successfully verified my address. In the end, I called the nearest Jimmy John’s restaurant and confirmed that I do in fact live within their delivery area. I placed my order using the phone and they successfully delivered my food to me. 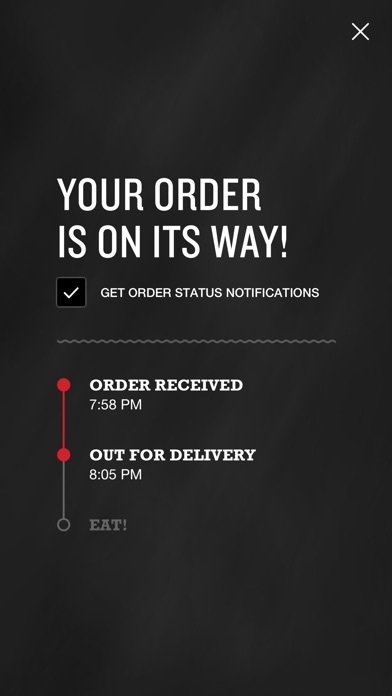 So, plus one to Jimmy John’s still being able to deliver to me using older technology. But, minus one for an app that, for me at least, doesn’t actually work. I’m guessing some address verification software needs to be fixed or updated, or some database of deliverable areas updated. Minimum stars for not being able to use the app for its one intended purpose when clearly I live within the delivery range of at least one restaurant. When I order they’re like we open at 10, and then they send my order to a store further away that doesn’t open until 11. So now I have to wait over an hour for this store to open, that’s farther away from my location anyway. This has never happened on the website. Garbage. Deleted, will never use again. 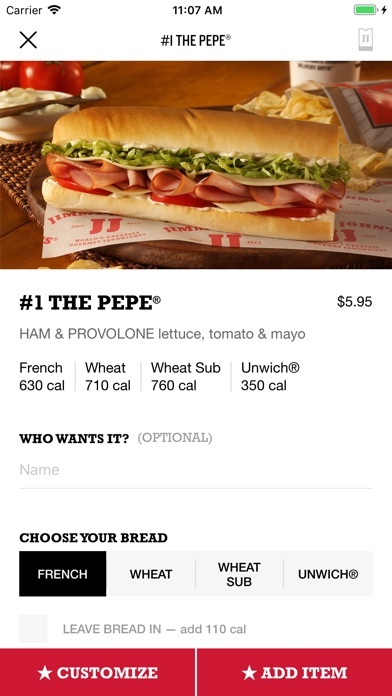 Can you make an option to customize your sandwich like the site allows?? Like add cheese, EZ meat, etc...? If you happen to be in an area with a lot of jimmy johns and you want to order from the store that opens an hour earlier than the others, but it’s .1 miles farther away then the one that opens later, you have no way of choosing stores. That’s really annoying. So easy to use, love the app and the tracker! Love the app and the food, but I found out today that my added gratuity using Apple Pay didn’t go through. Devs might want to check that out. The app is overall easy to use but there’s no place to make a comment. For example I don’t eat tomatoes but there’s nowhere to indicate that. I tried putting it in the name section but it didn’t work. I absolutely love this app. It works with my Apple Pay which is AMAZING. the updates are great! For some reason, you did away w the interactive nutrition guide and replaced it with that cumbersome pdf that no one wants to read. I love showing up at the store and everything is paid for and I don't have to stand there figuring out what the kids want. Anyone who gave this app anything less than 5 stars is just mad that they are spending so much money on delicious sandwiches because now it's easier than ever! Only suggestion is automatically including phone numbers on the order receipt. That way drivers can call if they have any trouble finding your place! I’ve only had Jimmy John’s twice now and both I used the app for. Super easy to use, and quick. I only gave a 4🌟 because I haven’t had a lot of use yet. So far so good. This app makes it all too easy to order your favorite sandwich. I’m at work hungry, impatient, and this app comes to the rescue along with their super-fast delivery. In fact, my sandwich is already out for deliver in the time it took me to write this. I ordered from the Jimmy Johns on Olson Memorial Hwy MN. The people there are great! I even had ordered once and I thought I didn’t get everything, but I was wrong. They were nice enough to come back and even gave me an extra sandwich even though it was my mistake! I love Jimmy Johns and the people working there are excellent! App is good. Thank God for Jimmy John’s. I don’t know what they pay their employees but it’s not enough. I get my order so quick and it’s always accurate. The app makes it so convenient. You rock, JJ! To find your order you have to go to your account page. That’s dumb. Then my order didn’t show all of the items. We ordered 5 sandwiches and it only displays 4. Doesn’t show the prices. Doesn’t say what time it will be delivered. It’s the worst app I’ve seen so far. I have to go to favorites (prior orders) to order a Beach Club because it is no longer on the app menu, other sandwiches are missing, too. What’s up with that? Honestly I love the phone app but it would be nice if the watch app worked at all for me. I have my freaky fast order saved and everything but it’s never worked for me. It was originally a redirect to their website, now it’s an actual app. Easy to use, Apple Pay enabled. Thank you! The app is almost as good as their delivery service. I swear the sandwiches get here before I even hit the submit button. You can order food with 2 clicks if you have Apple Pay. Quick way to empty wallet when hungry. I had to go without driving my car for a month after downloading this app. Couldn’t pay the insurance. The menu is all out of order and now it takes forever to find what you want. Great App. I have never had any trouble when using this app. It's freaky fast! I’m a college student, and a when I miss a meal and the dining hall is closed Jimmy Johns is my go to. While, I wish the classic sandwiches were a little bigger, the app has worked really well for me. I’ve been ordering delivery from it for almost a year now and have never had a problem. My sandwich always arrives in a decent amount of time and ordering is simple and easy (thanks to the user friendly format of the app). Makes ordering sandwiches pretty easy. And adding on chips or a cookie or a pickle is easy too. I just wish that you could customize your drink order too. So, yes, you can select the size. Great. However, please make the ice an option. (EZY, XTRA, None) and make the straw optional as well. Half the time they come bent anyway, plus, they’re just adding to the landfill. (Hopefully not getting into the environment and hurting animals). Thanks. The app is convenient and easy to use. I will say the new tracking is worthless.. you can’t say that you received the order and it’s out for delivery in the same minute and then it takes 20 mins to be delivered when the store is 5 mins away. I tried ordering a sandwich to be delivered to my house and I tried putting in my address but every time I clicked the correct address it would change to some different one. Deleted. This app is amazing!!! I really like how you can select delivery option. Never had an issue, it’s so fast that I freak every time I use it. Extremely intuitive UX, no problems with my orders (ever), friendly and helpful staff, and good sandwiches to boot. This deserves a 6/5 easily. Perfect sober or drunk, day or night, weekday or weekend. Jimmy Johns is the king of sandwich shops. Just go into a store, it will be a lot quicker and less of a hassle than fooling with this app...my conclusion after multiple attempts to order via the app. The store employees also struggled with explaining why it doesn’t work as expected. Love that you can customize...dislike where the Favorites are within the app and that it doesn't tell you when you have added the item from favorites to the cart. I've added the same favorite several times to make sure then in the cart saw multiple. But overall easy and quick. This app makes lunch a breeze! I love the ease of use. I just click on my favorite, checkout, and it sends me update notifications on the status of my order. So cool! If I were just rating the app, I’d go 5 star. But when I have a notification from 49 min ago saying our for delivery and I’m still hungry, you get a 2. Pretty upsetting. I love the Jimmy Johns app. Works every time and notifications are great about my order if it’s on its way or if it’s running a lil behind they always call which is refreshing. The app used to be great but for the past couple months it never loads. I've been waiting for an update but it doesn't seem likely. Cannot edit payment info. Cannot modify saved orders. Very difficult to use. If there is a delay, you don’t here anything. And then when you call, some jerk tells you they ran out of bread. Improve the customer experience! App is good, but I wish the ‘Edit Tip’ functionality would auto populate the decimal point when entering a custom tip. Seriously, who is tipping Jimmy Johns hundreds of dollars? This app is great and super convenient for ordering food when you are on the go. It works much faster than a web browser and ordering is very easy. The only thing I don’t like is that you can’t see the “customize” button for sandwiches unless you click out of the selection pane. Other than that, I love this app and I will keep using it when I order subs! Everything about it is perfect. The UI is smooth and fast. It’s very simple and user friendly, and makes it so easy to customize your sandwich EXACTLY what you want and HOW MUCH of what you want on it (which is one of my favorite parts). My only suggestion is that the sandwiches should be cut in half by default. But they give you the option right on the screen to cut it in half or even “unwich” it using no bread. I never leave reviews, but Jimmy Johns is delicious and their app is amazing. Usually it’s one or the other. I eat too much jimmy johns though. They are so convenient and fair priced. I love this place. This app is straight forward. Didn’t have a learning curve! Perfect for jimmy johns freaky fast reputation. The menu on the app has been ridiculously reduced. So much so that I’ll no longer be ordering there anymore. I’ve never had any problems placing orders. If only other apps could be as user friendly as this!!! Every time I try to online, no mater if it’s delivery or pick up, the menu won’t load. So I guess I won’t be ordering Jimmy Johns any time soon. I want 2 bags of chips - 1 each of 2 DIFFERENT kinds. 4 cookies of the same kind was easy! Simple, easy & fast. Never had a wrong order. Keep your password handy, app asks for way too many logins. Once a year would be acceptable. I love this app. Easy to use and quick. The delivery guy told me I was the first person to buy the gargantuan sandwich it was fast and easy and the delivery was so quick I did not realize he was there just after I ordered. Fantastic. Never disappoints. My order is always accurate, as customized and the ease of placing orders with the app is a snap. Contact information has to be entered every time I order, even though the information is on file in my account and can be retrieved from Apple Pay. 3 out of 4 times, something was missing that was paid for. I called the store and they asked for a 3 digit number on the receipt. There’s none on the online receipt. The App itself works well. Easy to use except about paying; if the shop takes Apple Pay then the App should too. Waited 1/2 hour without notice then went in to shop. Several people came & ordered & got their orders almost immediately but my order took another 20 minutes to complete. So why use the App?? An excellent show of a mobile food ordering app. Quick, easy, efficient. This app works perfectly and is a great interface. This helps the already freaky fast jimmy johns to be even faster. The tracker works well and is super accurate. Thanks jimmy johns! Order with drink never, ever comes with a straw. No other complaints. If I try to use the app, I get an error saying “No internet connection”. If I use the internet site, no problem. Why download the app? 1) It claims to store my credit card information, but if you select the stored credit card and enter the security code as prompted, the card doesn’t go through. I have reentered the card and had it approved, saved the card again, and the problem still happens. In other words, I have stored my credit card in their database at least four times, but every time I want to order a sandwich I have to enter my card info again anyway. 2) It does not remember my login. I have to log in to the app every time. My girlfriend and I are obsessed with this sandwich company. We get Jimmy Johns half the time we’re together. Is this obsession unhealthy? Possibly. Does it bring us joy and togetherness? Most definitely. This app makes the experience so much better. The best part is the easy tipping thing. Idek what to call it. But yeah. Great app, great food. The app works well, is easy to navigate, and I haven’t had any issues with payment, location selection, etc. This app is so easy to use and is set up perfectly. Always great ordering with it :) there was a new update that allows you to see calories/extra toppings. I wish I had the option of sprouts like I see in the photos when I order. APP IS BOMB. FOOD IS BOMB. SERVICE IS BOMB. thanks Jimmy John's ! App works as advertised to do. Cant find a complaint. My information is saved and immediately logged in when opening the app, Apple Pay works lovely, changing or adding items is simple (at least for me, I notice a few complaints). All in all, it’s quick and easy just how their sandwiches are made. So easy to use. My only complaint is they do not slice in half when asked for. Love jimmy John's otherwise. A good app, just takes a while to grasp and get the hang of. Two of my favorite things: the app and the sandwiches! Oh, and the speedy delivery, so make that three. I don’t write reviews on apps; mostly cuz I hate ‘em :) but this one’s easy to use and soooo convenient! Thank you for always delivering so quickly! I haven’t had any problems with JJ’s on the app, or the two locations I’ve ordered from (more than I care to admit). They’re fast on delivery, even faster in the store, and freaky friendly! One time they did forget my drink on a delivery once. I generally don’t get drinks so I didn’t even notice. Two hours later I get a knock on my door and it’s that same driver that found an extra drink in his car at the end of his shift. He took the time to look back at his recent deliveries, for a fresh drink for me from the store, and delivered it. Best customer experience by far! I only wish I had his name. This app is great! It’s fast and easy to use. The only problem I’ve found is there is no way to add hot jimmy peppers to my sandwich. A lot better than it used to be. Super user friendly. The app is easy to use, the order is always accurate and on time. The one time I needed to cancel an order the customer service was answered by a real person who didn’t transfer me... they took care of my issue in about 30 seconds. JJ is doing things the right way! They are always quick! Food taste awesome!! Haven’t had a bad experience yet!! I have been using this app for almost 1 year and I have to say that I have never had any issues with it at all. It is easy to use & straight forward. 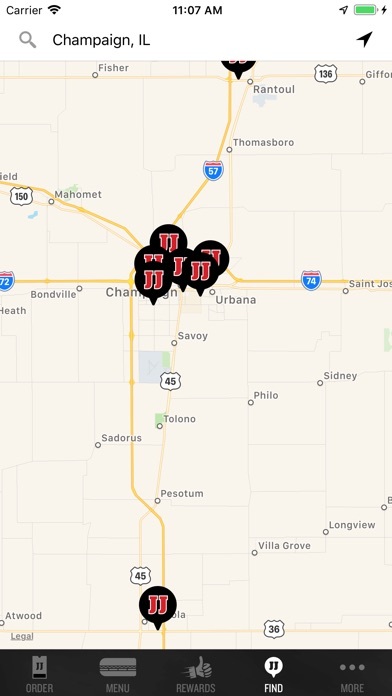 The location of Jimmy Johns that I order from is amazing. The food is always right, the delivery drivers are always prompt & courteous! I will remain a loyal customer as long as you continue doing what you’re doing! Thanks from Maryland! Great app, does what it’s supposed to do but I wish you had deals and more for loyal customers. The app is simple to use. Food in a flash. It’s generally easy to use but I do have a few minor complaints: I feel like it should be easier to reorder a past order. So excited the app is back and running again! Thanks, JJ’s! It’s one of my favorite apps to rely on! Favorite! Love how easy it is to order. Love app wish they had coupons or special deals for using app. Other than that easy to use. Love JJ’s. Pretty sure this new 5 min delivery radius is gonna cost them customers. We’ve been ordering for years and now we’re just barely in the delivery zone. Great staff makes a great unwich! Thank you for your consistent service! This app is an enabler adding to my Jimmy John’s addiction. Love it! It would be nice if you would incorporate a rewards program with the app. App is easy to use. Two napkins up! It’s difficult to wrap my head around how efficient they are in the food prep and delivery. Seriously, not one of my orders ever arrived late. In fact, I would argue that my experience in the app has so far been much better than my in-store (but not by much). Looking forward to their rewards program!!! Not sure if there is a way to save favorite items like the Dunkin’ app, if there is it’s kinda hard to figure out. Awesome App. Jimmy Johns is already super quick with deliveries but I always get in the app, click my favorite, and then start eating, all within 30min. Amazed at the quickness. The girl who delivers is really nice and I usually receive my order in like 15 mins. ...lives up to the advertisements. EZ AS (Possible) JJ’S : SWEETNESS!!! It’s super easy and I like it better than the website too! The app is great! I love saving orders. It works great and is fast and easy. Thank you! Easy to alter the order! Thank goodness for JJ on app ordering. I can stay at my desk on conference calls and still be able to have a wonderful lunch. Literally just ordered my meal, paid and wrote this review in less than a minute! Fresh food, great service and fast dependable delivery!!! Enter address, JJ APP accepts order, charges credit card and sends confirmation email. Five minutes later I get a call from the store (Bushwood, Elgin IL) saying they won’t deliver to my home 2.9 miles away. Funny how the Chinese restaurant RIGHT NEXT DOOR delivers here and the Panera across the street delivers here. Such a joke. Fix your fricken APP or honor the orders you accept. Thanks Jimmy Johns for NOTHING!!!! User friendly app and, the food always looks as good as the pictures! Always fast, friendly accurate service! Can’t bother to tell me the location is closed? It took a few tries to get my order placed. This is a good app and it is convenient to be able to order my Jimmy John’s through my phone. I chose four stars instead of five because it sometimes does some weird things with voiceover, but that’s my only issue and it’s pretty minor. Really good food and fast service. Great app easy to use. Took a minute to figure out how to add stuff to your sandwich. Like other meats or extras that might not be so easy to find. This is a secure way to order food. Thanks freaky fast. How do you use rewards with Apple Pay from iPhone. Hey Siri, get me a sandwich! Ordered jimmy J’s. Get notification on my phone that they are are. Approximately 3-4 minutes was when I received the notification. They are freaks. I order from this location a few times a week. I see the commercials on Tv about jimmy Johns being freaky fast.... well that is not my experience.... it’s more like freaky slow. Last week it was 1 hour before my order was delivered. I called and they always say the same thing... We got 9 orders at once... whatever?? The sandwiches are good!!! Would like to experience the freaky fastness that’s advertised!!! Love the new app layout and the rewards system. I’ve been waiting a while for JJ to do this. Thanks for the ease of use app guys! Awesome job! The App is pretty good. I’d like a little more customization with past orders but as long as I can adjust the toppings size - I’m good. Occasionally the store misses my topping variations but it’s more the exception than the rule. Best deli sandwiches around. Fresh ingredients and awesome huge dill pickles. Order often. Great food! Delivery truly is freaky fast! Order is always right. Just as ordered. Very good delivery people! Very easy to customize items. Apple Pay is the best way to checkout, even as guest. I don’t have to save my card info anywhere. Thx! Makes ordering your favorites a snap. Work can be crazy sometimes. It’s nice to be able to order, and run down between meetings and grab my JJ sandwich so I don’t get hangry! I don’t know if anyone else is having trouble signing into this App with their account credentials. I have not been able to sign in for awhile. The message I get is the Technical team has been notified. I order often either on the App or the website. Please fix this issue as fast as possible. Thank you! Doesn’t pick up my store, missing options on customizing, for example asking for mayo on the side isn’t an option so I have to call store. There isn’t a notes section and the rewards program doesn’t work the best and voided my reward. It’s a work in progress and I look forward to improvements I’m sure will be made! Love it when it works. Love being able to use apple pay. Wish you could save your favorites but other than that no complaints. You used to be able to easy save and reorder your favorite subs with all their customizations. This was great for me because I pretty much order the same subs and I loved how quick it was. Now that feature seems to be gone although the My Account menu description still says you can view your favorite orders there. Is this loss of a feature just a glitch or something wrong with my account? I always get my food very quickly, everyone is always so friendly too! The app is useful, but having access to favorites is a huge disservice. Need to add a section to add special requirements for each item ordered. Other than that app works well. My username and password are good but I just get a generic message saying the app is unable to log me in. "Contacting technical team." Tried it on iPhone and iPad. So there's goes my business. I have other food apps that work. A life saver when I'm too busy! I never know if my experience with this app will be great or terrible. When it works, great. But about 1/3 of the time something is wrong. Sometimes items just don’t show up. For a while, my local store only had bottled water under the Drinks menu. I called and they said it was an app problem and that they had everything available. Sometimes (today being one of those times) the app tells me that no stores deliver to my address, even though they deliver here ALL THE TIME. In fact, just now this was happening so I went to the JJ website to order and it went through just fine. It’s clearly an issue with the app. TL;DR: Buggy as hell but well designed and works great...when it works. Great app. Use it all the time wherever we go to get fast service. Has helped us find a good non-greasy lunch on the road many times. My favorite sub restaurant! No problems with ordering except they eliminated the favorites. I used to have the sandwich the way I wanted it saved and it was just one click. Now I have to reenter it every time. Even worse when I’m ordering for my whole family. Dude I love this app, I order food at work all the time. They never get it wrong either. Just yes. The app is a breeze, Totally Tuna is the BOMB and they’re prompt! Keep up the good service! The app is almost as good as the sandwiches! Delivery was quick and friendly. Will use it again definitely. The app is very handy and easy to use. I seldom rate anything. This app is easy to use, self explanatory and does its job. Whoever claims to have an issue with using it has other more serious issues, lol. Faster than going to the website. App is very easy to use & quick! Even quicker than computer I think! NO issues and super quick! Sometimes they don’t accept my credit card but this app is awesome and convenient. Not only is their app fast the delivery time, even better! The app is easy to use and I love getting the updates to know when to start looking for my delivery! Super easy to use the app to order sandwiches but it won’t ever let me log in so it doesn’t remember my address all the time. Other than that- it’s great! Overall the app is well done and responsive. My only complaints are that order history is tucked away into a hard to find spot, and it doesn’t appear that I can order my “favorited” sandwiches like I can (or at least used to be able to) on the website. This app is great and helpful! Foods always ready when I get there to pick it up! The service is fast and the delivery people awesome. They brought back ability to repeat orders— I’m happy. Now, LEAVE IT ALONE! Very fast, easy to use! Never had a problem and I’ve ordered countless of times. I am the least tech app savvy person and I have problems navigating most food delivery apps. JJ’s is the easiest and a life saver when I need something fast and I don’t have time to messing around with other apps and their services. I can quickly plug in my order pay with apple pay and I get my food in around 15 min. I noticed I can’t access my favorites anymore tho. What’s up with that? I would of docked a star if I haven’t been changing up my sandwiches lately. ......just ordered my sandwich 5 mins ago and I just received a notification it’s on the way. Love it!!! Thx JJ!!!! The app is easy to use and works great for me. I wish you guys would toast your subs. Only one thing to add would be the ability to see apartment numbers on the saved addresses and be able to delete previous addresses. Becomes difficult when you live in the same complex but just changed apartment numbers. Thanks! So convenient for a busy workday!! Best thing ever for a working mom that brings her kids to work!!! Italian vinaigrette aka sauce is no longer available on the app. I try putting it in the order comments instead but it never gets done. Bring it back to app please. Honestly, this is more about Jimmy Johns service rather than the app. I just wanted to say that I’m really happy with the effort you guys are putting in to make the app conveniently and efficiently work. The service is quick and fresh. Thank you for all the work you guys are putting in. The UX on this app is really great. I really like the app. I get too busy to stop and go somewhere for lunch. This is a great way to save time while at work. The only suggestion would be to add the option for 1/2 and 1/2 tea. Really convenient and easy to use. App is easy to use with exception of your account functions. Can’t remove old addresses and other things. Might have to login online to do this, but other restaurant apps have the ability. Also no place to our special food instructions as you customize food. There is a special delivery instructions spot but not sure they read that area while prepping. Great App. Love Jimmy Johns. Driving over to pick up right now!! This app makes it very easy to order and customize your sandwich. As quick as their delivery, and very easy. This app is extremely user-friendly, and it allows you to place orders very quickly. Photographs of the items help in placing your order. A lot of other restaurant apps could benefit from learning about the ease of this one. Great app. Would love if it saved your last order for quick reorders in the future. Great improvements in the app. Great functions, no glitching, nice, clean and easy. Much improved! So easy to use and super convenient when I need to order lunch at work. The App is convenient for ordering fast, especially if you can save your favorites to make it even faster. However, there are quite a handful of times when I have to reset my password because there are ‘Difficulties signing in and ‘Technical Support has been notified’. Otherwise, great for the main purpose of ordering. The JJ app is very easy to use. The pictures and descriptions are helpful and being able to click extra, more, reg or none for every ingredient they offer allows me to customize the perfect sandwich. Apple Pay in the app STILL doesn’t work on latest app version! Not sure if it requires the user be signed in, but it won’t approve payment. Keeps saying the card was declined, which is incorrect. You need to fix that and remove the requirement to be logged in if for some reason that’s the issue. Apple Pay needs to work! Best sandwich shop in Tuscaloosa . I will admit, the fact that my old orders weren't saved was an initial irritant. Then I started to use the new, updated app. Who cares if my orders weren’t saved?? This is so easy and convenient!! I’m a huge fan and will be ordering JJ much more often with this convenience. Thank you, JJ! Love it! Make your selection. Pay. Delivery! Works every time! I was so excited to be able to order a sandwich to be delivered, and then immediately disappointed to discover that the only way to pay was with Apple Pay. I DON’T WANT TO USE APPLE PAY. I wanted to pay cash on arrival or use a card not attached to Apple Pay. Zero business from me through the app until this is changed. What the heck?! Recent update removed all of my saved credit card info AND... no more saved favorite sandwiches?!?? Seriously? That’s ridiculously inconvenient and may change me wanting to use this app and patronize JJ’s. I hope this gets fixed soon! The app is intuitive and easy to navigate. I wish all delivery apps can be this easy and convenient. Love the Apple Pay option! This app is the best!! Working in the hospital and only getting 30 minutes for lunch, this app helps eliminate finding a number and an address closest to me. They are super fast!!! The app is great to get lunch without leaving the office, but the orders are usually incorrect or incomplete when received. Ordered a sandwich and a drink today only to have the drink half full when it arrived. Super easy to use. Food is always ready when I pick up. Great app.. easy to use. Very intuitive and easy to use. Also order from JJ using the app!! This app is easy to navigate. Makes ordering lunch super simple. I like the ap. I can order my sandwiches the way I like without having to try to explain the way I want them. I really miss the option to keep a favorites list like the app used to have. I consistently order 1 of 3 sandwiches that are customized but now I have to re-enter those options every time. Very intuitive and easy to use app. I wish some of the other restaurants would take note! Keep up the good work JJ’s. It’s all to need to survive. Super easy to use. Badda bing badda boom, the sandwich arrives just how you want it. 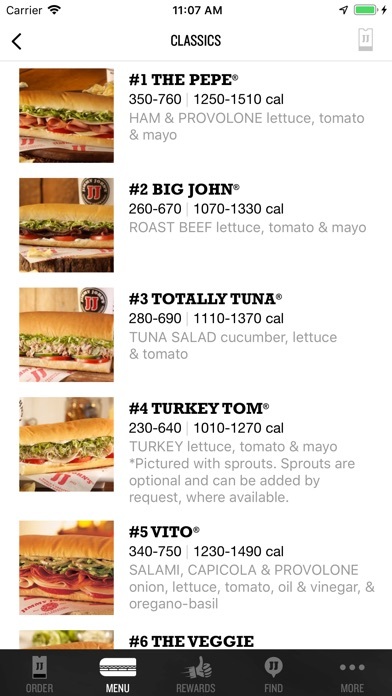 I love the Jimmy Johns app- I just wish you could track your order on demand. Not just by notification. I wish either of the two Jimmy Johns that deliver to me carried sprouts. They are pictured on some sandwiches but it isn’t an option to add. PLEASE restore favorites and freaky fast order. Ordering is easy and flows well. Good design including previous orders in the account. As soon as I learn how to order, they change something and it takes a bit of time to learn new things. Mostly I love to order ahead. The food is delicious and it is easy to use. It was easy to navigate through the app. Easy to use. Never had an issue, especially since they added the “repeat order” feature! App works great. Food is fresh and on time ALWAYS... I love it! Good food, app is simple. What more can I ask for? Never had an issue ordering early for a pickup when the store opens. I’m a JJ employee on vacation and I used the app for the first time and though it might take a minute to get used to, it is very useful and makes everything quick and easy. Awesome, very easy to use, and fast! Wish all food apps were this easy! Pay right from your phone with Apple Pay! Good, but what happened to saved orders? UPDATE: Repeat orders are back! Yay! Apple Pay works fine the app but fails in the store. In-store Apple Pay works fine at other merchants (e.g, McDonald’s), so something weird about the Jimmy John’s terminals? ORIGINAL REVIEW: Effective at walking you through the details of an order. Big thumbs up for accepting Apple Pay! The app used to save previous orders, making a reorder very fast. Saved orders disappeared and now one must enter the order details every time. This frequent customer misses saved orders. Please bring them back! Easy to use. Well laid out. Apple Pay is super nice. The app makes it so easy to order. I don't know how to order without it. Not much to say other than the app s easy to use and all the info you need is in the app. This app is very easy to use. Love it! Super freaky fast! Always good and great service! The app is convenient and easy to use. Favorites could be more easily accessible. Also the saved address feature doesn’t seem to be working as intended, or it is and could use an upgrade. The app removed my house as the main delivery location and swapped it to my work. Now I can’t get it to change back and have to change the address every time. 1. Do what you need to do to allow user to add CC info in “account info” 2. Allow user to use previous order for new order (similar to your reorder option) but allow user to COMPLETELY be able to edit order (remove items completely or edit each sandwich/item, persons name, etc.) THEN you would be a 4-5 star app! Love the app and the Apple pay, makes it so easy. The simple to use app makes getting the tasty food even easier! Very impressive app!! Simple and easy, and quick service!! Can’t beat it!! So easy to use and reorder. My only complaint is I don’t have the option to buy the box meal? What’s up with that? When ordering from app, what’s normally a box meal cost more. Get with it JJ. I use a lot of different apps for ordering food now days and Jimmy Johns App is by far the easiest and best app I’ve used. They have your cost broken down to inform you what every charge is. Use with confidence! It is easy to use an the service is just as fast! App is good but you can’t save your personal fav customized orders on the app. Would be a good addition. App works great. Wish favorites were on the first page after sign in, and not down in levels. I’m not good with online ordering but never have a problem with Jimmy John’s. Easy- to order to change to maneuver the site. Hey if it’s easy for me it’s going to be easy for anyone!! I order for pickup all the time and works great. Some little things: used to be able to save favs and can’t anymore, sometimes for delivery it tells me no stores are available (which is incorrect) so I have to pickup, the app rarely updates me on status (which I’m sure should be coming from the store so it may just be an issue with my location not doing updates). Overall great app and I use it all the time. I order from JJ 2-3 times/week and am still getting the message on the front page that the app has been updated and that I’ll need to sign in again (I don’t). It doesn’t have all the features of the old app, either. (Can’t save my favs anymore). Great app, easy to use. 2 different note fields have bugs that automatically set the focus of the cursor to the end of the text when trying to edit it. Also, didn’t get a chance to select my saved order when ordering, had to create a new order. This app was rough for a while. I just tried it since the last few upgrades and it went perfectly! Apple Pay worked like a charm. I will be eating more sandwiches now. No longer saves my favorite orders. That’s freaky sad. Love using the app and having my food delivered. I work from home and sometimes it’s not easy to leave to grab something to eat so I order JJ. They are fast, friendly and I never have any problems with my sandwich or the app. I can even order my kids their lunch (they live in a different state) and have it delivered to them also! Makes convenient when I am at work and in a hurry. Just wish it would stop telling me next login I have to reset my password. Annoying. Awesome app for acquiring awesome sandwiches, freaky fast. Always happy to place an order with Jimmy Johns. Always accurate and very tasty. Love you guys and keep doing what you do!! Appear to have worked out the kinks? I first downloaded this app last year and deleted it in frustration after a couple attempts. I redownloaded again a couple weeks ago and have completed 3 orders with no issues. I haven’t done anything too complicated, but it now seems to work as well as ordering on their desktop site. i love jj with a passion their number 9 smacks. And this app helps me get that food fast it’s simple and nice! Super quick! Easy to manage. And gets the job done so I can focus on eating ASAP! I love the app and more importantly love JJ!!! I order at least twice a week. Only negative is I can’t order “my fav” anymore but its still super easy ti use the app! I ordered a #17 and only got a small piece of beacon on one side? BOoooo! List a star fif that but it was still yummy!! I do a lot of ordering on-line, and this app is one of the better ones. I actually feel that I have better control over the taste of my sandwich using the app than I do ordering face to face. I recommend it. The app has been reliable and useful for the 5 years I have been using it. User interface is intuitive. It’s so convenient to use, I prefer placing order via app over trying to place one in person. What happened to our saved favorites? The saved favorites used to be so handy. Since the September “update” it’s worse! WTH is up with that? How INCONVENIENT!!! JJ’s Kicks! Seems like the Dude’s ringing my door bell before I hit send. Loving it! Simple and freaky fast to use! Best ordering app out there! I can have our order ready in less than a minute! Quick, intuitive. While insanely fast, I wish JJ had more options, although I know it would prob slow things down. Easy to navigate through the app. It’s a life saver when I’m at work! Have been using the app for a while and no matter where I am it has been easy to use and orders are accurate. Great app for a great place. Easy to use, consistently reliable and immediate access to some of the best sandwiches out there. I love jimmy johns but found that ordering online had its struggles when I found that they had an app I was thrilled and it’s been absolutely nothing but great. Never an issue, always on time or sooner! I get hungry, I order from the easy app and it’s delivered. I know when it will arrive. I never had a easier way to get my lunch! App is great. Very easy to customize your sandwich. There needs to be an alert that the chips are cooked in peanut oil for those that have allergies to be aware. The delivery is super fast most of the time. Some of the delivery guys get confused and deliver to the wrong place occasionally but it's still really convenient for work. Highly recommended. Great app. Great food. Quick delivery. I order out with a couple of apps. Domino’s is good, but I like being able to add the tip with the JJ’s app. And it’s really easy to navigate. Don’t change anything. Thanks. Please add to Fointain drink tea to the delivery options. Every time I order it, I have to make a comment (which is limited in characters and usually doesn't fit) and usually they don't read it and bring the wrong fountain drink anyway. One of the best quick food apps there is. No pop-ups, quick process, easy customization, quick freaky fast delivery, you can’t go wrong. What a great way to order lunch! Now if JJ could offer sausages! My favorites are gone. But hopefully they will get stored again or restored. Love Jimmy Johns, it’s a treat! The app is so helpful during a busy morning when all I have is 30 seconds to order a lunch for my son that can be delivered when I want. Thanks JJ. This app is super easy to use! I’ve never had a problem with it and everything’s right in front of your face! I love using the app. Please add a place for gift cards!!!! I love that this is app is user friendly! 🙌🏼, to the developers! This app works pretty well. When I first downloaded it, it was buggy like crazy, but it’s been steadily getting better. Earliest fastest way to get fed in a crunch! I ❤️ love this app! Easy, fast, and good food in front of you before you know it! Love it! Would absolutely get a five if I could edit out old saved addresses. Help!! Love Jimmy Johns and this app. Very simple for ordering delivery or take out. Quick and easy choices you can customize to your liking. The tracker doesn’t work as well as I’d like, but otherwise it’s a good app. Order for work a lot. The app lets me order quickly just like the delivery. I occasionally have a challenge in the app but overall it is very convenient and easy work with. I love this app so much it makes it so easy to order I almost prefer to order through the app then I do at the actual restaurant itself because then I can pick and choose little details that I want. This app was not user friendly for me. My payments/orders will not process and the app gives no suggestions for how to remedy the situation. Very easy to use, and I love the repeat order feature! I haven’t had any issues using the app, my own impatient ness is what frustrates me. It’s easy to place an order, adding payment was too easy! Of course the food was fantastic. The app is amazing and very easy to use. Just understand that Jimmy Johns his quick because the distance is short. If you’re not close to the location, they want no deliver. I live in a small town with ONE Jimmy Johns and I can only get delivery in certain places 🤷🏽‍♀️ I say worth a shot. This App is very easy to use. Best of all, you can use it from anywhere. I love the customize option. Quick and convenient. App is easy peasy. Will rate delivery and customer service later. 5 star for the App. Quick and easy! Always accurate orders. I know of no faster or easier-to-use app for ordering food. Very user friendly and easy to use. Allows for easy sandwich customization and makes ordering multiple orders a breeze without any confusion. Makes ordering so easy, consistently delivered without delay. Love this app at home and work, all my info is there and I just pop my order in, it is here really fast...Freaky Fast is right!! It runs well, doesn’t crash, allows full customization, but lacks the biggest thing for a good delivery app, and that’s live tracking of the delivery. Why can smaller companies like Grubhub, DoorDash, and Ubereats provide this but Jimmy Johns cannot? I absolutely love jimmy johns! I order from here weekly! The app is easy to use the only thing I think would make this better.. would be if they had perks. I’m always ordering from here & perks would be nice for customers like me! The app is a good idea, it’s handy and works well with orders. What I don’t like is the fact that you can no longer save favorite orders, if it’s meant to cut time and make ordering faster and easier then why remove that option? I also didn’t like the time I’ve ordered and the driver dropped off my order at the guard-shack w/o calling me. I called to check on my order and was told the driver had returned to store already, when I asked about my order and why no notification I was told his phone didn’t work so he just left it there. I didn’t appreciate that at all considering I had already paid and tipped him. My food sat there for 45min and my break was nearly over by the time I got to eat. Great app very user friendly and easy to navigate. Easy to use and my food arrives fresh! Delivery is very very fast and drivers have always been friendly. Able to easily get what we want, customize order including labeling of each sandwich. Everyone gets what they want quickly. App is good. Could use favorites or previous orders thing to make ordering quicker. Makes all my ordering super easy. Also has Apple Pay which makes it even faster and easier. Food is always ready when I need to pick up and delivery is super fast as usual. Love this app but please offer your large drinks. will not let me use a gift card for part of the payment and a debit card for the rest. now i can’t get food so fix the app please. Best way to get the Freaky Fast ball rolling. Works well. Use 2-3x a week. Jimmy John’s app is great! App used to be problematic - but it works great now! Easy to use and it is now easy to navigate within the app. Thanks! No problems here. Apple Pay works like a charm and app is easy to navigate. I use it quite often. App is easy to use and I like how it keeps our favorites. I also like how we have to update our passwords periodically. The app itself is great, however I’m giving 4 stars because I always select to cut in half and my sandwich is never cut in half. Small thing, I know, but what’s the point of having that as an option if it’s just going to be ignored? I love Jimmy Johns and this app just makes getting my favorite lunch freaky fast and freaky easy!!! Easy to use and good maneuverability. The app itself is great but Jimmy Johns is the only app that doesn’t offer loyalty rewards. I must order a few times a week and they do not offer any perks. So unless you just want the convenience of ordering don’t waste your time. I’ll be going back to PotBelly’s. Freaky fast is a well deserved description! I love this app. It’s super user friendly and makes tracking my food so much easier. The best part about this app is that it clearly defines each item and presents all options available to me. I love this app. And I’m so glad I don’t have to call anyone for assistance. I’ve never run into a problem. I only stop eating at Jimmy Johns when they suspend sprouts. What is a sandwich without sprouts? The app is easy to use but there is no way to save your favorite order so you don’t have a to create a new one each time and it never pulls up my previously used address. You should allow users to give delivery instructions. It would save a lot of time for the runners and a lot of hassle for the purchasers. Save your favs. Order to be delivered right from your app on the phone. Love it! Easy to use, and quick. Love it! The app works great. And is very efficient. My only complaint is that you have to reset you pass word every time if you don’t use the app weekly. I placed a $30 order for a store that is closed on New Years. Awesome. Subway is still too disgusting to be an alternative, so now I’m out my money and faced with the grim reality of my refrigerator. We had a thing JJ, but it’s over. 2019 is the year of the homemade sandwich. Place and customize your order using a simple menu. Easy and user friendly. If anything I would like to see is digital meter showing the orders progress. But otherwise it’s a great app. Easy to use. Quick ordering and then wait for the speedy delivery. Apple Pay is great. It’s a little annoying that it constantly wants me to reset my password but using Apple Pay allows me to not have to log in. It’s quick and easy to order I recommend the app. Thank you for the convenience of the improved app. The new app has is not better than the old one. Bring back favorites, freaky fast orders, saved login information, ability to see order status within the app... I understand some of the UI was improved, but I’d rather go back to a buggy app with more functionality than this one. couldn’t order anything cause it said it was undeliverable to my location. Order it online without the app and everything works fine. I checked my location service settings so don’t ask me any STUPID questions. Fix your crappy app. The app is very easy and amazed at how quick my sub arrives. Everything is fresh. this app used to be pretty buggy and now it’s easily the best food ordering app i have. EVERY SINGLE APP SHOULD HAVE THE OPTION TO USE APPLE PAY!! TAKE NOTES, PIZZA HUT!!! Traveling salesman here with 100+ nights a year away from home. Love the food!! Love the App!! Love JJ and the teams across the U.S.
Love the app so much it is very user friendly in that it is easy to navigate and it lets you control everything you would do in person at the store. Make delivery orders or quickly order and pay for pickup and walk in and out in seconds. Love it and love JJ! I used to order sandwiches often but I looked and I haven’t ordered at jimmy johns since 4/22/18 and it’s exclusively because the app just won’t work. I don’t know if this is a problem for other people but it won’t accept my password which I know is right and it won’t send me an email to change my password so here I am about to order food from literally any other restaurant again. I just wanted them to know they’re potentially losing lots of money because of the app. Mainly I don’t understand why it can’t even send me an email??? Do you no longer support aol email because that is literally the only thing I can think of. Easy app but miss the “saved favorites”. I order the same sandwiches every time & it was nice to not have to enter them in each time. The app is easy. I pay with Apple Pay. This as quick as getting the food! I’ve been using this app for a couple years now. It’s easy and very quick to use. I find myself all over the place frequently, so I often order to different addresses, and it has been very easy to switch between my home and whatever address I happen to be at, which is something that cannot be said about most ordering apps. As always, my food arrives far more swiftly than I expect, but having the notifications updating me on the order have been well appreciated. Fairly easy to use. Had a couple of false starts first time, but easily found my way thru to the yummy! App is easy the use. Great layout. Quick service. I love Jimmy John’s! Food is always fresh. Everything always tastes great & the people are always friendly. This app is easy to use & delivery is always super fast! Keep up the good work! Easy to use, easy to customize, easy to pay and also easy to watch the progress of an order! You ask for a sandwich whether or not you’re drunk and it shows up at your door. Works with Apple Pay. I’m pissfaced now with a sandwich or two on the way. 5/5 welcome to the future. Took me a few go arounds to get used to it. They don’t have the sandwiches listed like they are in the store so I accidentally ordered the wrong sandwich. Now I know where to look for the name of the sandwich so as not to make that mistake again. It was sad when I got it, not realizing I had ordered the wrong one, but was completely user error. Do wish they would list by sandwich name. But just my preference. I love this app.. I love jimmy johns.. there sandwiches are better and nearer than subway sandwich’s 😝 I just order another 5 minutes ago..
One of the better online food apps. Most apps that brands use for food ordering are subpar at best. Not this one. Touch ID is a godsend since most of these apps log you out all the freakin time. Can pay with Apple Pay or stored cards. Interface isn’t just some BS web view. The ease of ordering and paying makes me order JJ’s way more than I should! Don’t bother. Don’t even know where to start. This used to be a flawless, perfect app. I’ve even brag to others about the past versions of it. It made it so easy to order. Fast forward to tonight, was told as soon as I open the app that I had to reset my password. It lost all of my details including my home address, and my payment information. On top of that, it took me through that process three different times every time I try to get out of it it would start me over from the beginning. It couldn’t even locate a nearby location (two blocks from my house and I’ve been using them for years) that would deliver food to my house. The app kept insisting on the pick up option. Ridiculous. I had to call in the order and asked the guy about the menu options. Defeated the entire purpose. I ended up ordering my food like I used to 10 years ago. Over the phone. No point in having this app. 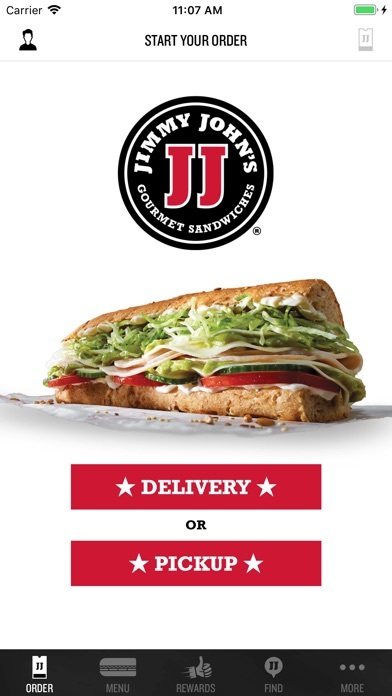 I like JJ sandwiches fine - they are great quality and tasty, but the ease of ordering makes me a more frequent customer than I would otherwise be. Easy as heck to order a sandwich when I’m hungry and want to eat. That’s all I asked for too. Thank you Jimmy. The older app had a option to save your sandwiches as a favorite, it seems as though that is no longer an option. Also when I try to repeat an order, it seems I can only repeat the entire transaction, including the location and whether not I want it delivered or to pick it up. This is frustrating if I want the exact same food but want to get it from a different location. Driving home I realized my wife had my debit card from the night before. I had no cash on me and I was hungry after a long day. I remembered the app, grabbed my phone, opened JJ’s app, cruised through the window (2 hours from home), and had a #12 w Coke and Thinny Chips. Would have been a long 2 hours home without my JJ’s app.